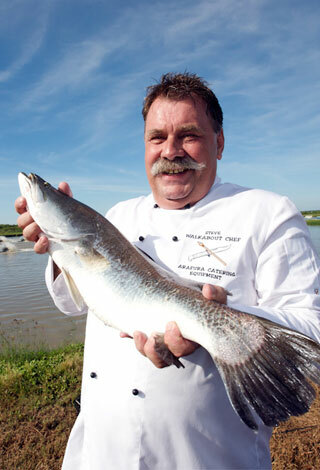 A Master Chef at Charles Darwin University, Steve Sunk has been working with remote Aboriginal communities for over 15 years. His 'Back To Basics' cookery course teaches communities about nutrition and provides an alternative to the fried fast food that has caused diabetes and coronary disease epidemics. Over 12 years the course has evolved into an inspiring fusion of traditional Aboriginal foods and modern Western culinary methods, a result of which was the first cordon bleu bush tucker cook book, 'Walkabout Chefs', with recipes such as bush banana salad with balsamic vinegar, kangaroo tail braised in Italian tomato and herb sauce and wild greens and crocodile frittata. In 2009, Steve was awarded the Medal of the Order of Australia for his service to education through curriculum design and development and as a teacher to the indigenous communities of the Northern Territory, and to professional organisations. In 2007, Steve won the Northern Land Council's Top Trainer award for his work in teaching cooking and nutrition in indigenous communities. Also, in early 2007, Steve launched his book, Walkabout Chefs, detailing his experiences in the bush, accompanied by some 40 recipes of Aboriginal bush food created with students from remote communities.